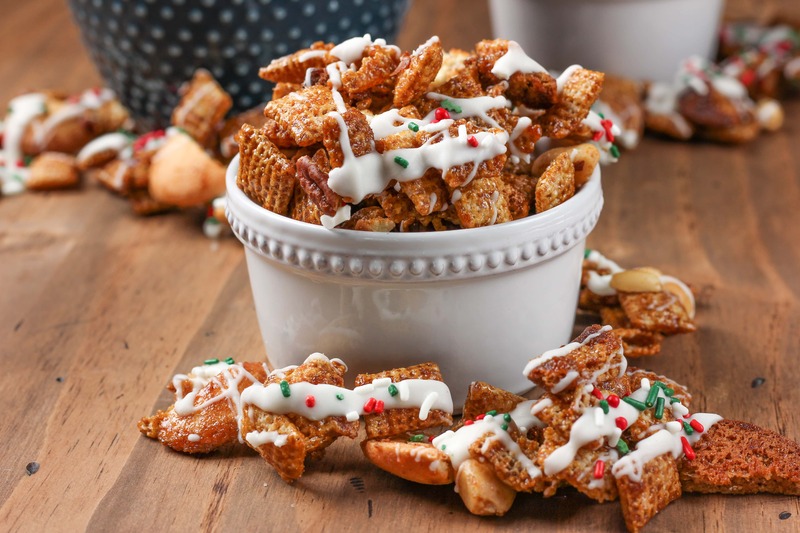 This White Chocolate Gingerbread Chex Mix has all of the flavors of gingerbread combined with creamy white chocolate and a handful of festive sprinkles to create your new favorite holiday snack! I have discovered a new snack mix that I can’t resist. It came about after I was thinking through my menu recently. I had all of the main meals and dessert covered, but hadn’t thought about what to have on hand to snack on. 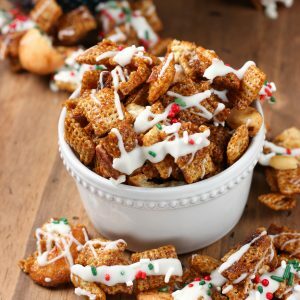 I looked through some of my favorite snack mixes and realized that I didn’t really have any that were filled with flavors of the holiday season. 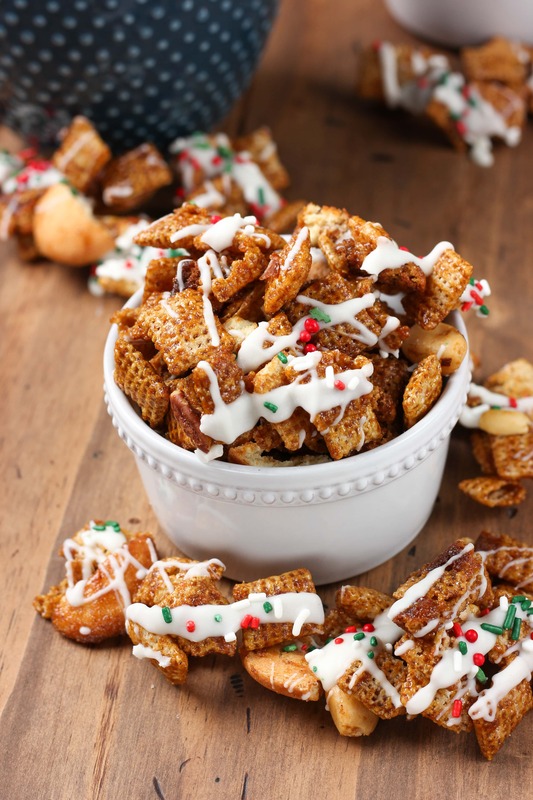 That had to change, and it wasn’t long before this white chocolate gingerbread chex mix appeared in our kitchen! All of the flavors of gingerbread combine with creamy white chocolate and a handful of festive sprinkles to create your new favorite holiday snack! 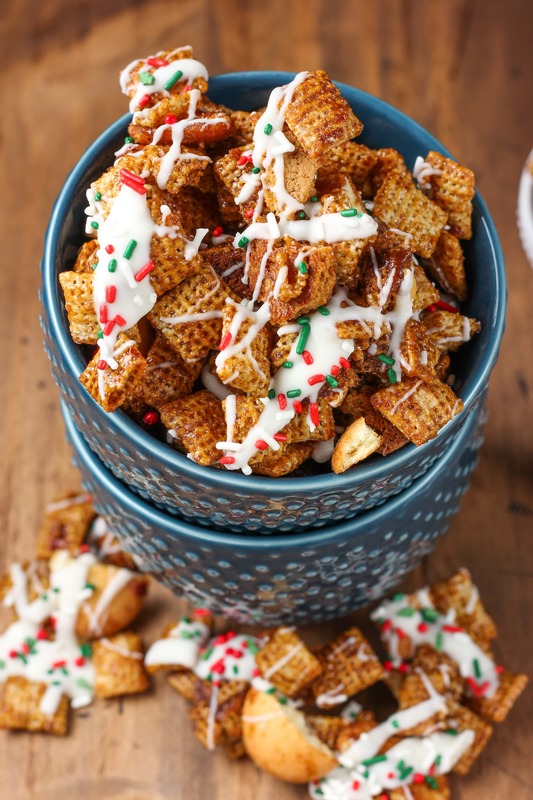 All you have to do is stir together your cereals in nuts, melt together your molasses, butter, brown sugar, and spices, stir the wet ingredients into the dry ingredients and microwave for a few minutes. Toss in the remaining gingersnaps and vanilla wafers and microwave for a couple more minutes. Spread it out on wax paper (or parchment paper) lined cookie sheets. Drizzle some white chocolate over the top and cover with a handful of sprinkles. The only hard part is waiting for the chocolate to harden so you can dig in! Set out a big bowl for your family and friends to munch on this weekend, and don’t be surprised if you find that one batch isn’t enough! In a large microwave safe bowl, combine cereals and mixed nuts. In a small microwave safe bowl, combine butter, molasses, brown sugar, cinnamon, ginger, and cloves. Microwave on high for 1-2 minutes, stirring after 1 minute, until sugar is dissolved. Pour molasses mixture over cereal mixture and gently toss to coat. Microwave for 2 minutes, stirring after 1 minute. Gently stir in gingersnap and vanilla water pieces. Microwave for an additional 1-2 minutes, stirring after 1 minute, until cereal mixture is well coated. Spread mix out onto prepared cookie sheets. 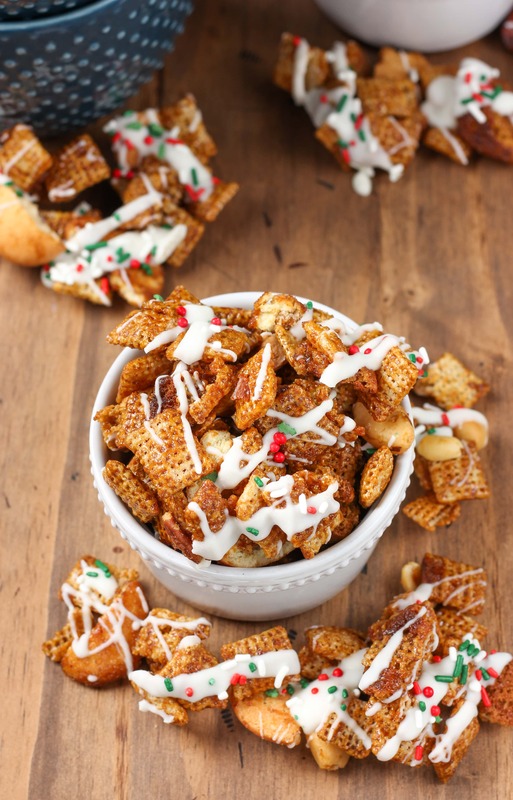 Melt white chocolate and drizzle over chex mix. Top with sprinkles, if desired. Allow chocolate to harden. Break into pieces and serve.